Pg 68: In the section on addiction bugs, add this sentence: A person with these bugs finds their CoA won't or is very hard to move from a fixed spot, often the head. Heal the generational with bug's emotional tone. Pg 74: Heading, AVOIDING AREAS OF THE BODY, 2nd paragraph, 3rd line, ...especially a BACTERIAL one. Pg 74: especially a BACTERIAL one. Pg 146: 2nd para. Can't go in body vs dominant child issue. Pg 146: To the Symptom Keywords, add: 'Can't get into my body'. To the Differential Diagnosis, add: Dominant Issue: Although both keep a person partly out of body, the dominant issue makes childhood seem very negative or makes the person unable to recall much of it. The void does not affect memories. Pg 164: you can project on objects also. Pg. 173: Under ICD-10 codes, add F33, F34.1 at bottom of page. Pg 177: In the Asperger'e syndrome page, add F84.5 ICD category. Pg 183: "This problem is global: it occurs in all membranes, not just the cell or nuclear ones." Pg 235: "The time loop egg-like structure is actually made in very early development as a defense put there by the pinecone organism, against class 1 bug-like and class 2 fungal parasites that eat the next generation of of the pinecone organism. Pg 237: "…what was done earlier in the other MDP." to "…what was done earlier in the other personality." 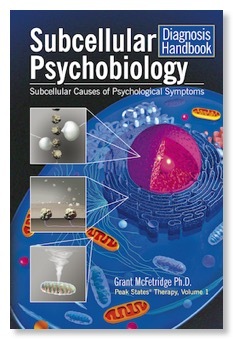 Pg 238: Under 'Underlying Cause': The time loop phenomenon is caused by an egg-shaped structure that is build by a pinecone-shaped organism in the nucleus to defend its next generation from other parasites. Under 'Risks': No known risks if the time loop is healed int the present. Regression healing can cause a problem due to activating the parasite in the developing client. Pg 240: Under 'Symptom Frequency & Severity': Although this problem is very common in the general public, it is infrequently encountered in clients except with some chronic problems that have resisted attempts at healing. Pg 250: Add Abyss to the list of potential causes of depression. Pg 272: in this HANDBOOK as subcellular cases: And might add page numbers for each case. Pg 319: Add link for Generational Trauma technique: The Whole-Hearted Healing Workbook by Paula Courteau. Pg 343: Add Abyss case to F33 and F34.1.